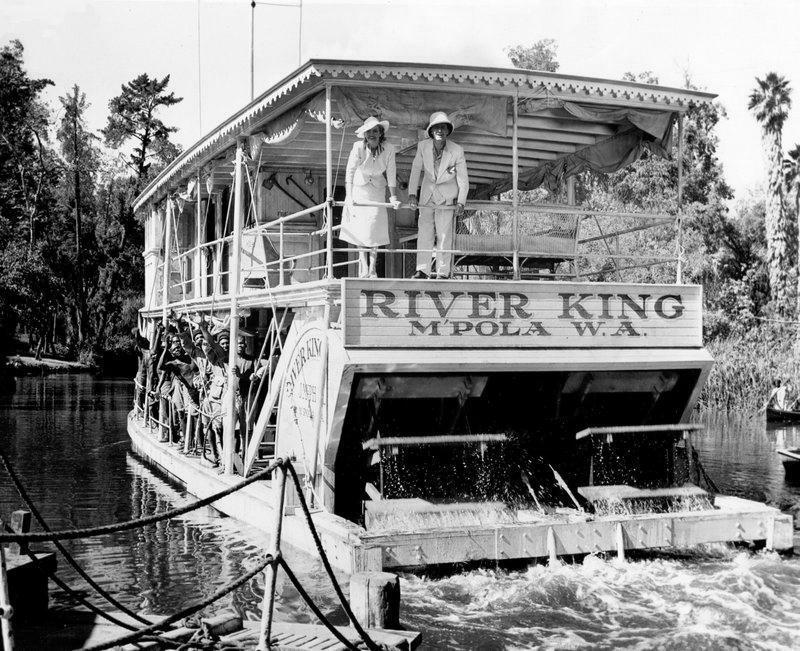 Two movie stills of the full scale "prop" sternwheeler called the RIVER KING for a 1940 Paramount release called SAFARI with Douglas Fairbanks Jr. and Madeleine Carroll. The setting was on the Congo or some other river in Africa. "M'Pola" is a place located in Thekwini/Durban, South Africa but the initials "W.A." seem to suggest West Africa. I've been looking for photos of this prop boat for many years and located the "long shot" from an eBay in the Netherlands recently and in the interim came across a photo of the boat just departing the wharf on the Arboretum's site. As a boy "the jungle" was a fantasy attraction to wander through narrow trails with overhanging foliage which has since been redesigned and designated as a "Rain Forest." 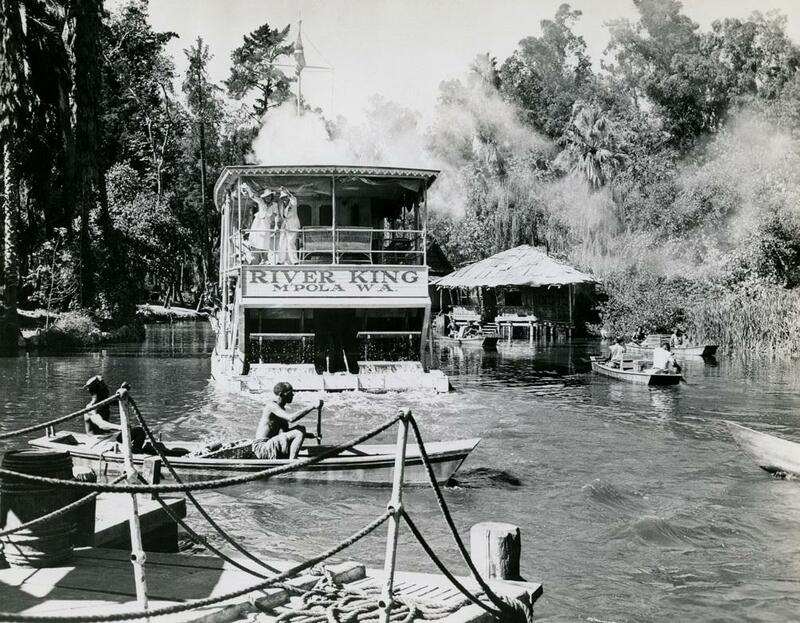 From the 1930's and on into present day the jungle/rain forest and lagoon/lake has served film makers as an ideal location for movies set on tropical islands, Africa and South America. It is best known for the use of the jungle and lagoon in several of the TARZAN movies, in 1976 as a Nazi hideaway in Paraguay for MARATHON MAN, and in Alex Haley's ROOTS series with James Earl Jones as Haley himself searching for genealogical evidence of his ancestor Kunta Kinte in Africa on the Gambia River. There must be something, after all, in the report that those safaris, or hunting expeditions, on which wealthy society folk used to go into the heart of Africa in quest of big and formidable game were pretty tame and inconsequential affairs. For the "Safari" which Paramount is currently conducting in the comparative safety of its own Paramount Theatre is not a great deal more exciting than a Sunday picnic at the Bronx Zoo. The only game which a fearless script-writer has been able to beat into camera range is a herd of feeble clichés. And the only trophy of any importance which Madeleine Carroll brings back as a token of conquest is the animated pelt of Douglas Fairbanks Jr. Right off the bat you get a hint of what's in store when the beautiful Miss Carroll, cool and "clean," as Mr. Fairbanks later describes her, looks dreamily out across the starboard rail of Tullio Carminati's palatial yacht toward the steaming shore and murmurs, "I think I'm going to like your Darkest Africa." And she does. For it is there that she meets Mr. Fairbanks, a bold and dashing fashion-plate for what the well-dressed African hunter should wear. And it is back there, in the pleasant wilderness surrounding a luxurious compound, that she discovers the superiority of this impudent young adventurer over her contemptible fiancé, Mr. Carminati. But into this classic story Paramount has injected a note of current solemnity. Oh, yes, indeed. Mr. Fairbanks, we are given to understand, is a great lover of liberty, passing a little time in Africa between fighting in China and heading north for the European war. "This," he warns Miss Carroll, "is my last safari." And she, after hearing him expound with impressive gravity, becomes a liberty-lover, too. "We are not the same people we were," she tells a bewildered Mr. Carminati at parting. "Something has happened to us." And Mr. Carminati returns to his yacht alone, still uncomprehending. Incidentally, we are still wondering whether Mr. Fairbanks finally got away to the war. When last seen, at the fadeout, it looked as though he was going to be indefinitely delayed. Considering the silly things they have to do and say, both Mr. Fairbanks and Miss Carroll manage to preserve their professional reputations. But Lynne Overman, in droopy whiskers and dirty clothes, casts all discretion to the winds and goes around making strange noises like a Scotsman in a bad vaudeville act. If the others had shown the same disregard for acting and the script as did Mr. Overman, "Safari" might have been a very funny farce instead of a very poor drama. Jim Logan . . . . . Douglas Fairbanks Jr.
arboretum.org Three thousand years ago, the homesite of the earliest inhabitants of today's Los Angeles County Arboretum amp; Botanic Garden was known as Aleupkigna, "the place of many waters." With the arrival of the Spanish in California some two hundred years ago, the residents of Aleupkigna became known as the Gabrielino (in reference to the mission responsible for their conversion), and the land upon which they had lived before removal to the Mission became Rancho Santa Anita, an agricultural outpost of Mission San Gabriel. Hugo Reid, a Scotsman with Mexican citizenship, married to a Gabrielino woman, became the first private owner of Rancho Santa Anita and in 1840 constructed his adobe house next to the lake. When Elias Jackson "Lucky" Baldwin purchased Rancho Santa Anita in 1875, he acquired not only the natural lakes and cienegas on the property, but water rights in both Big and Little Santa Anita Canyons just north of his homesite. The Baldwin Ranch was situated on a 2,000 acre artesian belt, a benefit of its location atop the Raymond Hill Fault. Sixty percent of Baldwin Ranch irrigation waters came from artesian sources, the remaining 40 percent from canyon waters. Baldwin Lake, which served as a holding reservoir for ranch irrigation projects, was dredged and deepened, perhaps 12-15 feet, by owner Baldwin in the late 1880s, and a retaining wall, capped by granite boulders, was constructed around the lake edge. "Baldwin's Belvedere," today known as the Queen Anne Cottage, was built in 1885 on a peninsula jutting out into the horseshoe-shaped lake; the springs that feed the lake are located in both the north and south inlets. Lucky Baldwin supplied residents of the city of Arcadia with a combination of canyon and artesian water of such quality that a Los Angeles Herald reporter commented, "Why, if this God-given fluid were piped to Los Angeles and distributed to the city, the saloons would lose half their customers, and water drinking would become fashionable." In early Arboretum days the lake was designated LASCA (Los Angeles State and County Arboretum) Lagoon, perhaps a reference to its film location possibilities, perhaps a corruption of the Spanish word for lake. 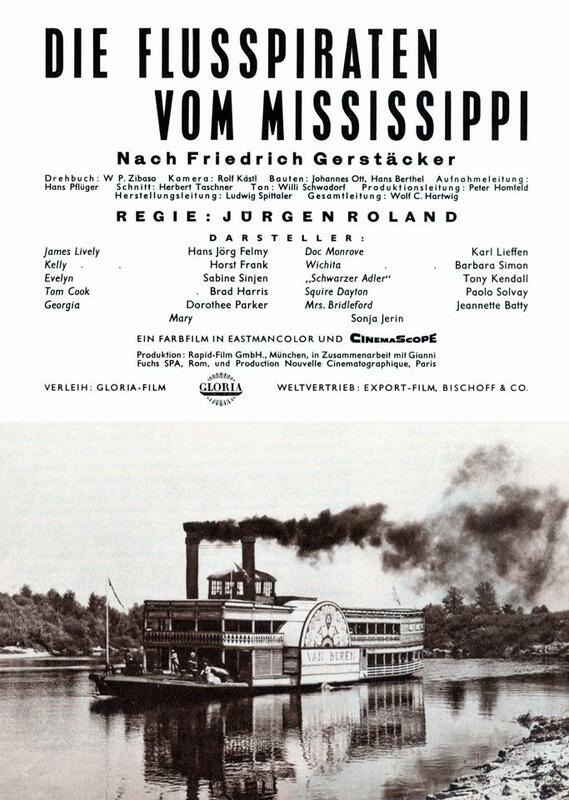 One of the first all talking Westerns after the end of the silent movie era, this steamboat sequence was filmed on the Sacramento River, standing in once again for the Mississippi River. The movie also used many other picturesque locations in the West. One of the local Sacramento River sternwheelers transporting some would be pioneers from the east was painted gray so that it would appear to be weathered and dingy instead of bright white as we would expect. John Wayne (standing next to the wagon in the upper right) was given his first big break as the lead character of Breck Coleman hired to deal with Indians when they were encountered by the wagon train heading west from the shores of the Mississippi. Wayne's character had evidence of treachery and murder committed by Tyrone Power Senior's odious and repellant villain Red Flack who is heading up the wagon train while scheming to betray the settlers when they are most vulnerable. Ian Keith played Louisiana gambler Bill Thorpe, in reality just a con artist who has eyes for the same girl John Wayne's character is smitten with, the heroine Ruth Cameron played by Marguerite Churchill. THE BIG TRAIL was the first Hollywood movie to use a widescreen format, which the 20th Century Fox studio called 70mm GRANDEUR. 23 years later that format became known as Cinemascope when Fox filmed the Biblical epic THE ROBE. This movie is available on Blu-ray and DVD formats in both widescreen and conventional Academy Aspect ratio format in which it was most widely seen since only 2 theatres: one in L.A. and the other New York could project the widescreen version in 1930. The first of three Sauerkraut westerns produced by Wolf C. Hartwig, all starring former peplum star Brad Harris and a young Horst Frank. The movie is part of a trilogy, the other two entries being Massacre at Marble City and Black Eagle of Santa Fe. Horst Frank is John Kelly, a disgraced Cavalry Colonel, now the leader of a gang called the River Pirates. With the help of the Cherokee tribe, Kelly wants to attack the river boat and the small town of Helena. Harris is an old acquaintance of the local sheriff (Felmy), who's falsely accused of being a member of the gang. He's saved from the gallows (in Blondie/Tuco style!) by his old pal and of course helps him to investigate the case. 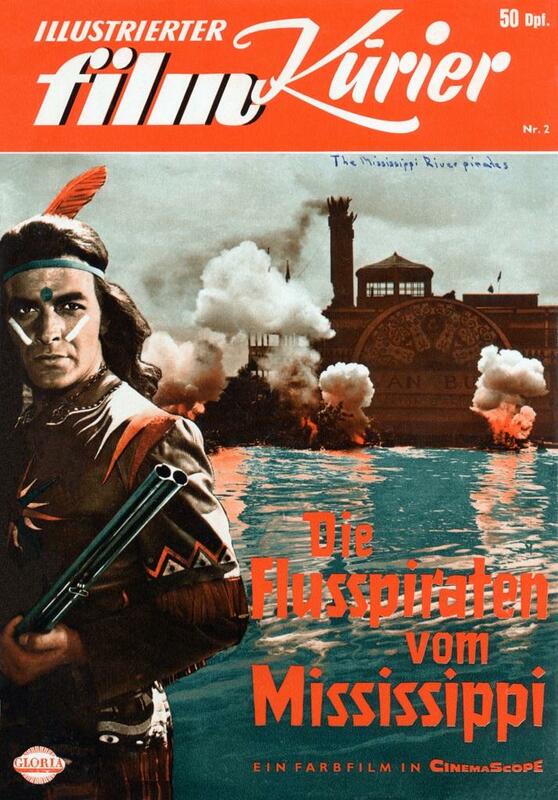 This was one of the first Sauerkraut westerns, made in the wake of the first Karl May adaptation Treasure of Silver Lake (1962). The novel by German author Friedrich Gerstäcker had several subplots that kept the screenwriters more than busy. They changed a couple of details (in the book gang leader Kelly leads a double life as the local judge, in the movie they're two different characters) but the script remains a rather intricate one, with lots of characters and complications. Felmy looks a bit too sophisticated for the role of a western hero, but luckily Horst Frank is cast as the villain this time around (in the other two entries he'd play a positive character). Kendall/Stella has always maintained that he was offered the role of No Name in A Fistful of Dollars; if so, Leone had probably seen him in this one. It was made prior to Fistful and when watching it, you'll notice quite a few scenes and plot devices that would pop up in Leone's famous movies. Even if these similarities are coincidental, the movie has some considerable historic value. Gianfranco Parolini directed the action scenes (the fight scenes were choreographed by Harris), who would reunite Harris and Kendall in the years to come in a series of spy movies. It's also the first appearance by Dan Vadis in a European western. Like most Sauerkraut westerns Pirates is a corny affair, but it's quite lively, a bit plot-heavy maybe, but good fun when you're in the mood for these type of movies. Rolf Kästel's cinematography is impressive, but the film has a rather odd look, due to the vivid, occasionally even dazzling colors of the costumes. Frank later confessed that they had been used shortly before in the Munich Carnaval Parade. Ein Bier, bitte. Detail of a still of a scene from MGM's 1953 adventure film "Mogambo," filmed in Darkest Africa at locations including Okalataka, in the French Congo and the Kangera River in Tanzania. At the helm of this propeller driven steamboat was British character actor Laurence Naismith as the "Skipper." 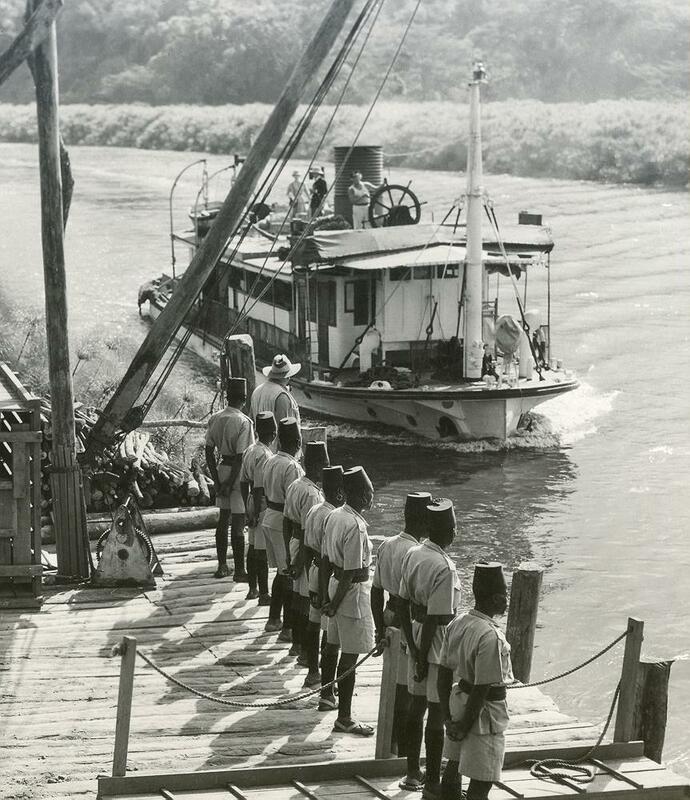 John Ford, who had directed "Steamboat Round the Bend" 18 years earlier on the Sacramento River was in charge of cast and crew in"Mogambo." Clark Gable starred as "White Hunter" Victor Marswell, co-starring with two "love interests," ravishing Hollywood beauties: brunette Ava Gardner as Eloise "Honey Bear" Kelly and Grace Kelly as Linda Nordley. "You're stuck with us until next week's boat." "You mean there's no way to get out?" "Shipwrecked, and me without a desert island to my name. A catastrophe,a bleeding bellyful of bad luck." "About three miles down the river, the engine packs up. The current got hold of us and drifted us onto a mud bar." Attached photo, was taken during production of THE SUN SHINES BRIGHT with 5 ladies in costume, 2 of them carrying parasols, aboard the steamboat used in the film. The 2 white smokestacks may have replaced a single stack which could have been what the original boat had, or "fancy tops" could have been added to existing stacks to make them look more old fashioned. The pilot house name board is illegible so we can't identify the boat or look up its history. Could have been built back in the 'teens or 20's. This steamboat is the first thing we see after the opening credits in THE SUN SHINES BRIGHT and a on the starboard side of the boat was a banner urging everyone to "VOTE FOR JUDGE PRIEST." Must have been filmed on the Sacramento River. 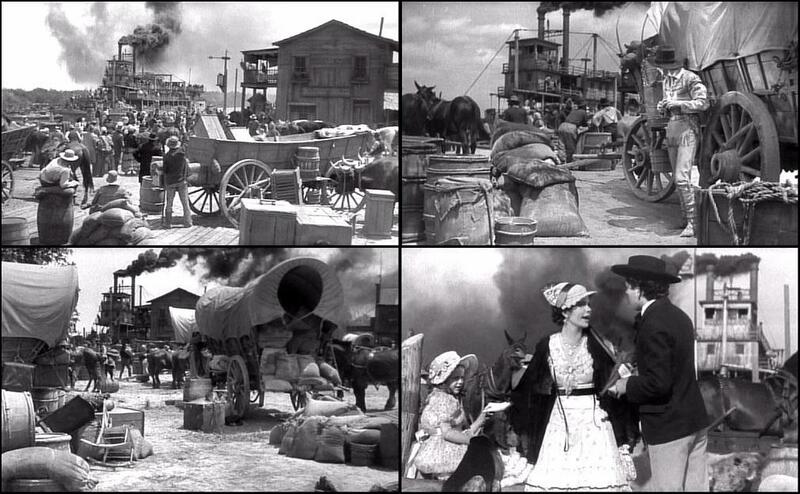 Opening scene of John Ford's favorite film, based on 3 of Irvin S. Cobb's JUDGE PRIEST short stories set in Cobb's fictionalized hometown Paducah, Kentucky on the Ohio River. Cobb was Cap'n Eli of the "PRIDE OF PADUCAH" in STEAMBOAT ROUND THE BEND opposite Will Rogers had the title role in John Ford's 1934 movie JUDGE PRIEST, also based on Cobb's character and stories. Charles Winnenger (who played Cap'n Andy in the 1936 James Whale version of SHOW BOAT) plays Judge Priest in this movie. The film is based upon three short-stories by Irvin S. Cobb, a prolific writer of 60 books ands ome 300 short stories, many of them centered around Judge Billy Priest, with characters based on people he knew growing up in Kentucky in the 1890s. Cobb was also one of America's greatest journalists being the highest paid reporter in America. The Sun Shines Bright is a 1953 American drama film directed by John Ford, based on material taken from a series of Irvin S. Cobb stories. Ford had adapted some of the same material in 1934 in his film Judge Priest. That film originally had a scene depicting the lynching of Stepin Fetchit's character (and Priest's condemnation of the act), but it was cut by 20th Century Fox. The omission was one of the reasons Ford loosely reshaped the Cobb stories two decades later as The Sun Shines Bright for Republic Pictures, this time including Judge Priest's defusing of the mob determined to lynch U.S. Grant Woodford (played by the young black actor, Elzie Emanuel), with Stepin Fetchit playing the part of Judge Priest's assistant. Ford often cited The Sun Shines Bright as his favorite among all his films, and in later years, it was championed by critics such as Jonathan Rosenbaum and Dave Kehr, who called it "a masterpiece". Black sheep Ashby Corwin returns to his native Kentucky on a steamboat. He encounters young Lucy Lee, ward of Dr. Lake, and is struck by her beauty. In court, Judge Billy Priest, who is a candidate for reelection to his post, adjudicates a number of cases, including finding a job for "Uncle Plez" Woodford's idle nephew, U. S. Grant Woodford. Ashby learns that while old General Fairfield is said to be the grandfather of Lucy, he denies it. On the street, after Lucy is the subject of insults by Buck Ramsey about her true heritage, Ashby gets into a whip fight with Buck before the judge comes by and puts a stop to it. Lucy eventually discovers who her real mother is, a prostitute recently returned to town. Meanwhile, the daughter of Rufe Ramsuer is assaulted and young Woodford is blamed and arrested, causing racial tensions to rise and a large lynch mob to form. Violence seems imminent until Judge Priest confronts the mob at the jail house and defuses the confrontation with an eloquent and brilliant argument. Later, Rufe's daughter points to Buck as being her true attacker. It is election day. Those in the lynch mob realize that Judge Priest has saved them from themselves, and they vote for him en masse, producing a tie with the other candidate, Horace K. Maydew (played by Milburn Stone). It is pointed out to the judge that he hasn't yet remembered to cast a ballot himself, so he wins reelection by a single vote, his own.